575 Wandsworth Road (the former home of Khadambi Asalache) must be one of the more extraordinary buildings that I have ever been asked to assist with. I vividly remember the impression made on me when it was featured in The World of Interiors, in the 1990s, and then again in the Sunday Telegraph Magazine, some ten years later. The house and its neighbour are a pair of early nineteenth century buildings on the Wandsworth Road, in South London. Both are Listed Grade II and consist of two storeys with a basement. Unremarkable from the outside, No 575 however has an extraordinary interior. 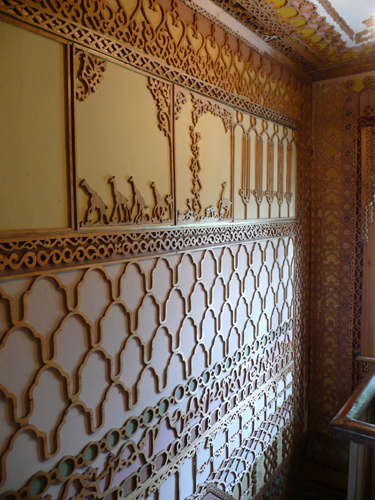 Every surface in the house has been decorated with hand carved wooden fretwork, paintings and collections of English lustreware and East African objets d’art. The interior was created by Khadambi Asalache, a Kenyan born poet, writer, architect, mathematician and civil servant. He was the son of a tribal chieftain who, according to family legend, watched over the family goat herd in school holidays with a volume of Shakespeare on his knee. Initially studying architecture in Nairobi, he was diverted and spent the next few years in Rome, Geneva and Vienna, where he studied fine art, moving to London in 1960. There he survived by teaching Swahili, working for the BBC African Service and doing some architecture and garden landscaping, while he wrote fiction and poetry. In the early 1960s he helped to write and produce an instalment of the ITV series Danger Man that was set in an African city. His first novel, The Calabash of Life, came out in 1967, although he had difficulty finding a publisher for a second, The Latecomer, which he eventually sold to the BBC African Service, who ran extracts from it on two days in January 1971. In 1973 a collection of his poems were published by Eothen Books as Sunset in Naivasha. In the late 1970s Asalache took an MPhil in the philosophy of mathematics at Birkbeck College. He then became a civil servant at the Treasury, and it was while travelling to work that he spotted a For Sale sign on the Lambeth house from the top deck of the 77A bus. Realising that the bus route would take him almost door to door from his house to the office, he bought the house for less than the £31,000 asking price in 1980. The property was in a poor state of repair, having previously been occupied by squatters and since the kitchen is virtually underground and the basement on one side had been ‘tanked’ it was extremely damp. Khadambi had the room lined with old floor boards scavenged from skips, but found the effect heavy and oppressive, and decided to add a little homemade ornament – a project that was to last for the rest of his life. 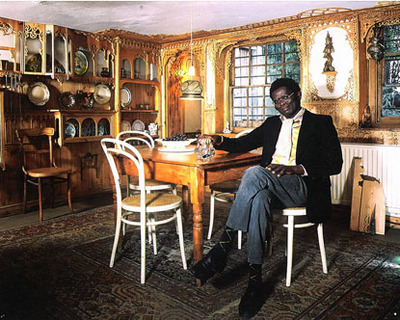 In 1986 he began in earnest to line the walls with never symmetrical or repeated fretwork shelves, arches, architraves and friezes, delicate as cobwebs, the motifs including birds, geometrics, dancers, flowers and leaves, Africans going to market and animals (though not carnivores). He used hundreds of motifs, both abstract and representational, inspired by African, European and Islamic design to create an exquisite fantasy world. 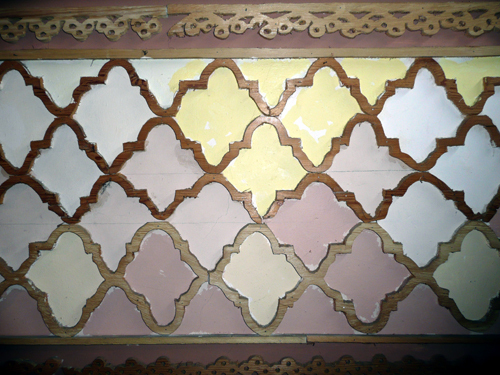 For 20 years, he decorated the house with fretwork which he cut by hand in the garden from discarded pine doors and wooden wine cases. The intricate woodwork was augmented by illustrations of African wilderness, and his collection of 19th century English lustreware pottery. 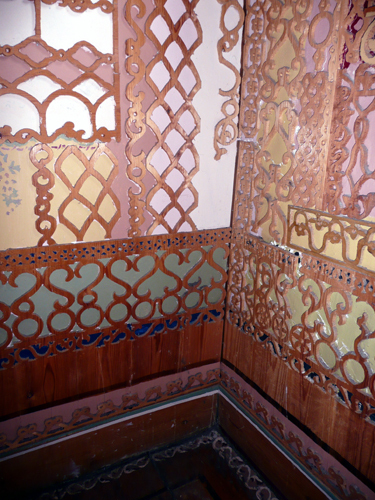 The fretwork decoration starts on the back of the front door and lines the narrow entrance hall. The downstairs rooms feature myriad shelves for his collection of pottery and upstairs can be seen a bedside kennel for the Tibetan spaniel belonging to his partner Susie Thomson – and their entwined initials on the bedroom window shutter. Guided by Asalache, he pinpointed the sources: the Great Mosque at Cordoba, the Alhambra and Generalife Gardens in Granada, the doors of old houses in Zanzibar, the wedding-cake-like panelled interiors of Damascus, and the yali — wooden houses in Istanbul. Khadambi Asalache died of cancer in 2006 leaving the house to the National Trust in his will. However, it is in poor condition, with damp walls, rotten window frames and a roof that needs work. Furthermore, the interior is incredibly fragile and very small. It could never accommodate more than a handful of visitors a day, and the conservation questions that it raises are complex. The disabled will find it hard to negotiate and school parties are going to be very difficult. Small as it is there is no room for an income-generating shop or café. The Trust hopes to be able to use part of the Old Laundry next door – which was acquired by Khadambi’s partner as a studio – to provide interpretation and education space. The Trust has managed to raise sufficient money to acquire the house, but are keen to attract additional funds for future conservation. “This whole house is a work of art, and it is our duty to find a way to care for it and share it,” Ian Wilson, the Trust’s London area manager, said. Elsie Owusu, founder of the Society of Black Architects, said the house had international significance. The National Trust has recently finished carrying out essential conservation and building work and is now opening the house to small groups. 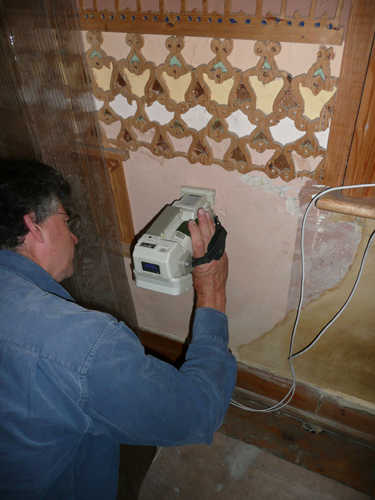 The conservation programme at the house needs financial support. The National Trust is a charity and does not currently have sufficient funds to meet all of the costs. If you feel that you can help please would you make a donation to support this essential work. Donations can be made by phone on 0844 800 1895 quoting ref no. NT11001EV or at www.nationaltrust.org.uk/donations. I was fascinated to see you have been engaged to work on this wonderful house. 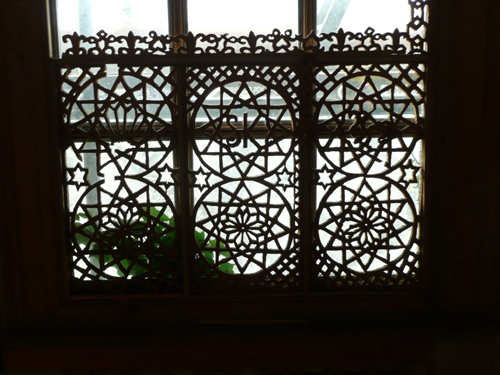 I had the good fortune to meet Khadambi about fifteen years ago and spent an enjoyable evening with him looking at the beautiful fretwork panels. It is in the tradition off the enthusiastic and artistic amateur such as the shellwork found at at A la Ronde. Yes, you’re absolutely right. How lucky to have met the man himself. How wonderful to hear that. He seems to have been a truly remarkable man. 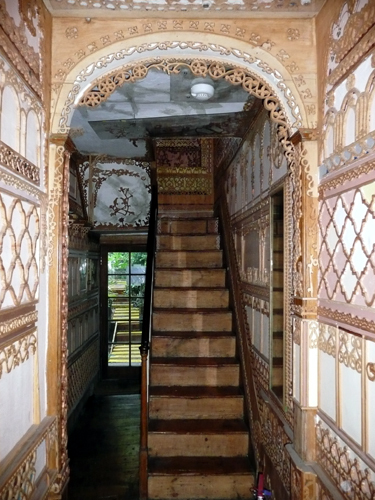 I hope that more people will have a chance to see this truly unique house next year when the restoration finishes. Enjoyed my visit to 575 Wandsworth Road very much, a mini Alhambra in London. Not keen on the dirty light switches or his toothbrush and soap being left though. A difficult property for the NT to keep safe and manage. However, great that they are attempting it.